Maximise the comfort and style of your Apple AirPods while ensuring you never lose them with these sleek, durable silicone covers. 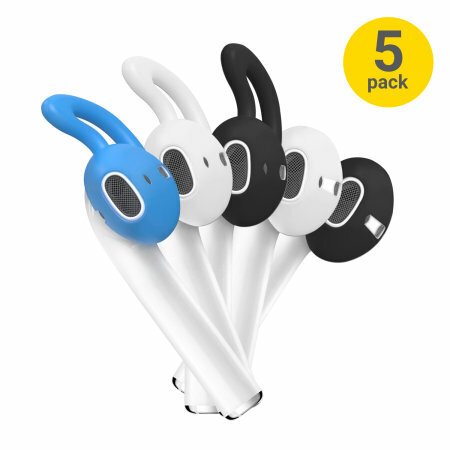 Pack contains 5 pairs of covers - 3 with hooks, 2 without - for astonishing value and the ultimate in Airpod accesspories. The do not fit in the airpods holders once installed and need to be removed all the time, limiting the times that can be used answering calls. Perfect to make calls or to use for music. Ear pods always fall from my ears. The little wings retain my earpods in place even when I run. I was about to return the earpods back to Apple since they were constantly falling, but this saved the day! The fit is average (improvement from nothing on the AirPods). But you lose them after a week. You have to take them off the AirPods after each use since you cannot close the charger. They are too big, a sloppy fit. Very disappointed. Solved iphone ear bug problem! My iPhone earpods would always fall out when I used them at the gym. Got to be so frustrating, I stopped using them. The ear pod covers finally keep the earpod in my ear. I am very happy with this product.